The redesigned performance versions of the Impreza are expected to debut in November at the Los Angeles Auto Show and go on sale in early 2014. Subaru likely will drop the five-door and only produce a WRX/STI sedan. In March, Subaru showed a WRX sedan concept at the New York auto show with a coupelike body and integrated spoiler. The concept had the signature WRX hood scoop. The engine likely will be a high-performance version of the 2.5-liter four-cylinder boxer that produces at least 265 hp. Mazda is in the middle of a product blitz that will put its Skyactiv technologies, designed to cut weight and boost fuel economy, in nearly all of its vehicles by the end of 2015. Other changes will come quickly under a new product planning strategy. Mazda intends to update major products more often, changing powertrain technologies, interiors or body styling -- or a combination of those -- as soon as updates are available, rather than sticking to midcycle changes in a vehicle generation's third year of sales. The Mazda6 and CX-5, for instance, will get new interiors and updated front fascias next year, roughly 18 months after the redesigned Mazda6 went on sale and about two years since the CX-5's debut. Mazda has a redesigned CX-9 crossover arriving for the 2016 model year and hopes to make a design statement with the next-generation MX-5 Miata. Here are highlights of Mazda's product plan through the 2017 model year. Mazda2: A redesigned Mazda2 is to go on sale in the second half of 2014 for the 2015 model year. The second generation of Mazda's subcompact will ride on a new platform with a Mazda Skyactiv powertrain. Under the hood will be a small-displacement -- likely 1.4 to 1.6 liters -- four-cylinder engine with gasoline direct injection. The Mazda2's interior will be an evolution of that in the 2014 Mazda3 that goes on sale this fall, and a significant improvement from the utilitarian appointments in the current Mazda2. The Mazda2 that went on sale in the United States three years ago was the midcycle update of the Mazda2 sold in Europe. Mazda's U.S. product planning team worked on the next-generation model from start to finish. 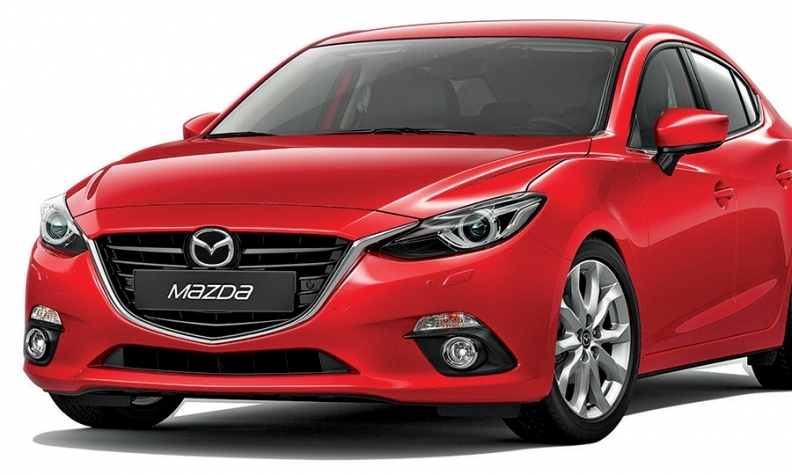 Mazda3: A redesigned Mazda3 goes on sale this fall for the 2014 model year. The third generation of Mazda's perennial best-seller incorporates the full suite of Mazda's Skyactiv technologies. Engine offerings include 2.0- and 2.5-liter four-cylinders combined with six-speed Skyactiv automatic or manual transmissions, though Mazda3s equip-ped with the larger engine will be available only with automatics at launch. Mazda has stuck with its four-door sedan and five-door hatchback strategy for the 2014 model year redesign. A diesel engine may be added to the Mazda3 powertrain lineup, but the company wants to see how American buyers respond to the diesel-powered Mazda6. A high-performance MazdaSpeed3 has yet to get the green light. Production of the MazdaSpeed3 ended this summer. The Mazda6 interior, seen by some as bland, will be redone as part of midcycle changes. Mazda6: Despite getting redesigned for the 2014 model year, a re-engineered Mazda6 is scheduled to arrive in late 2014 or early 2015 with a new interior and updated front fascia. 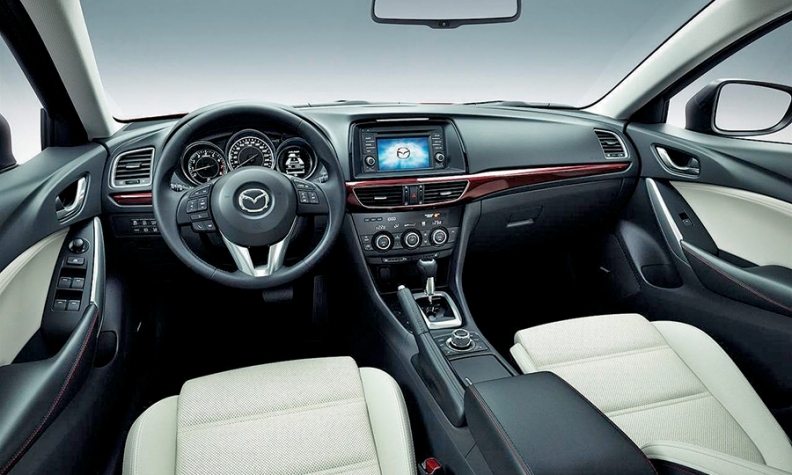 Since the debut this year, the redesigned Mazda6's interior has been criticized by some as bland. Sources say the new interior will include new gauges, instrument clusters, materials, center stack design and seating surfaces, as well as a version of the connectivity and infotainment system in the upcoming Mazda3. The new interior's overall aesthetic will be similar to that of the 2014 Mazda3, but more refined to help the mid-sized sedan keep its place atop the hierarchy of Mazda's cars. A 2.2-liter turbodiesel will be added to the powertrain lineup this year. Sources say that a hybrid powertrain is under study. MX-5 Miata: Mazda's iconic roadster will be redesigned for the 2016 model year and is scheduled to go into production in the first quarter of 2015. The new rear-wheel-drive platform underpinning the fifth generation of the roadster will have a longer wheelbase and wider track than the MX-5 Miata it replaces. Sources also say that Mazda is trying to shake up the MX-5 Miata's design by working on a coupelike roofline that would give it a fastback-style silhouette. Fiat also will use the MX-5 Miata's small rwd platform for the Alfa Romeo Spyder, which sources say will have a slightly stretched wheelbase, longer front and rear overhangs and a wider track than the its Mazda counterpart. The 2.0-liter four-cylinder from Mazda's Skyactiv portfolio powering the CX-5 is expected to be the main engine choice for the 2016 MX-5 Miata, and a second engine is likely, though it's unclear whether it would be a bigger one aimed at providing more power, or a smaller one for better efficiency. Mazda5: The future of Mazda's small van is up in the air. U.S. consumers haven't embraced the Mazda5 or competitors such as the Ford C-Max in large numbers, and while the segment is larger in Europe and Japan, those markets are struggling overall. Mazda would need a strong global business case to invest in a major update of the Mazda5. Sources say the plan for the Mazda5 is to continue sales with no major product changes for the foreseeable future. The Mazda5 is not scheduled to be moved onto a new Skyactiv platform, nor will it get a Skyactiv powertrain, sources say. But it's likely to stay on the market: Despite selling just 10,023 units of the Mazda5 this year through July, Mazda needs North American sales for the vehicle to be profitable globally. CX-5: Like the Mazda6, the compact crossover will get a new interior and an updated fascia for the 2015 model year, though the interior changes will be less substantial than on the Mazda6. The infotainment and touch screen used in the Mazda3 are also expected to be used in the CX-5 when the update arrives in the first half of 2014. CX-9: Mazda's largest vehicle gets the full Skyactiv treatment when the 2016 model arrives in 2015, though more precise timing is unavailable. The Skyactiv architecture that underpins the Mazda6, CX-5 and Mazda3 will be scaled up for the redesigned CX-9. The mid-sized crossover's sheet metal will also reflect the kodo design language used in recent Mazda redesigns. The CX-9's biggest question mark is what will be under the hood. Mazda lacks a Skyactiv V-6 and has no plans to add one. There simply isn't enough global volume to justify the development costs for a new V-6 family based on Skyactiv. That leaves Mazda with two options for the CX-9's powertrain: using a turbocharged four-cylinder or sourcing a newer V-6 engine through one of its industry alliances, which include pacts with Toyota, Fiat and Nissan. Sources say no decisions have been made on the CX-9's engine lineup. Rotary sports car: Sources insist that a rotary-engine sports car is in Mazda's long-term product plan. Mazda's main priority is generating consistent profits from its mainstream vehicles before devoting substantial funds to bring such a niche car to market. So the launch timing for a successor to the RX-7 and RX-8 is unknown.